Get on Board for an A.J. Adventure! There’s no way around it: A.J. Burnett is a badass. (He also gets extra points for not being as mean and nasty about his badassery as his buddy Josh Beckett. But I digress.) Last night he didn’t really have control of anything but his fastball, but you gotta respect the way he battled. I was surprised to be thinking in the seventh inning that they should have kept him in there a little longer. Yes, three wild pitches and four walks are not ideal. But when he needed an out, he buckled down and got an out. That’s the kind of resilience I want to see. Joba should stop arguing with Jorge and start asking A.J. what he does to calm down in those situations. Swisher on the other hand loves being out in the field so much that he needs to dispel some of that pent-up energy with little hops, skips, and jumps up against the padded walls. He must have been an exhausting little kid. I kind of understand why Girardi talked to him in the dugout about it, but I tend to think that Girardi is Debbie Downer. C’mon man, Swisher is high on life and you’re just killing his buzz. All in all, the game moved a little slowly for my taste. 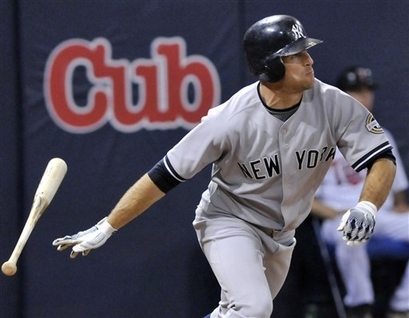 My boy Brett Gardner was actually the only one trying to inject any speed into the proceedings. My fondness for Brett continues to grow with each passing day. I don’t care what people think the racial implications of calling a white ballplayer “scrappy” or “gritty” are. That’s not how I see it. White, black, Latino, Native American: if you exceed expectations, prove you can help the team, and don’t take your spot there for granted, you’re good in my book. I want you on my team and I will call you scrappy, gritty, gutty and, occasionally, awesome. Keep it rolling, Brett the Jet. Finally, I just want to say how endearing Francisco Cervelli’s comments were about his time in the big leagues. Now that he has returned to AAA-Scranton, and even though I have a soft spot for Jose Molina, I think more people than just CC and AJ are going to miss him. The drama! The intensity! The incredibly terrible call by this here ump! 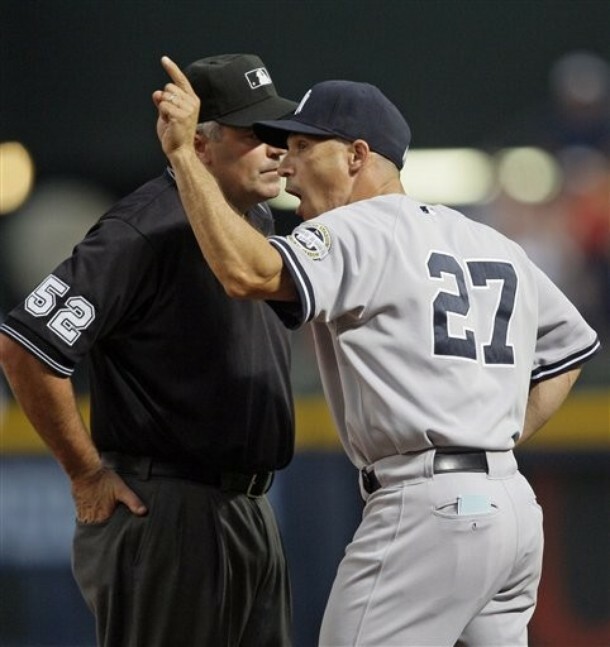 I believe that a manager getting thrown out can fire up his/her team. But in this case, I think it was actually the bad call on Gardner getting “picked off” first. It wasn’t even close. Something that maddening is bound to push a frustrated group right over the edge whether the manager gets thrown out or not. And it did. In a good way. Francisco Cervelli, who does have a way of making good things happen (although I am emphatically not in the group calling for Posada to be put out to pasture), hit his first major league home run, and nobody in the dugout even bothered with the pretense of giving him the silent treatment. Mo’s got a bat! Look out. He actually hit the ball pretty hard to center field, although it was caught by Nate McLouth. 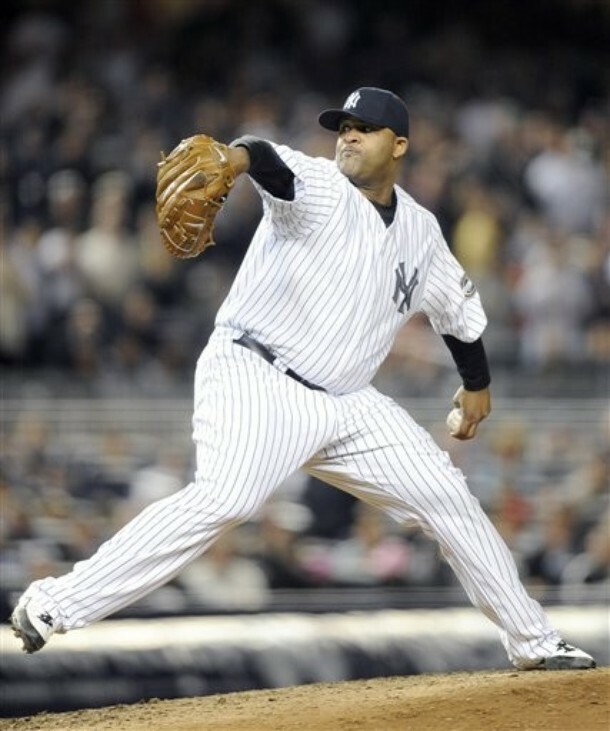 Of course, CC Sabathia’s reaction was priceless. As soon as the ball came off the bat he started jumping up and down like a mad man. It was kind of an awesome moment. That’s the kind of enjoyment I look forward to seeing from my boys. I hope we get to see lots more of it in the near future. He only gave up three runs, but he left in the fourth after 85 pitches, leaving the bullpen to blow up the game. Which they promptly did. Oh sure, one of the few guys who’s actually hitting in clutch spots jams his arm against the wall trying to make a catch? They said last night that tests were negative, but Melky will have an MRI today. 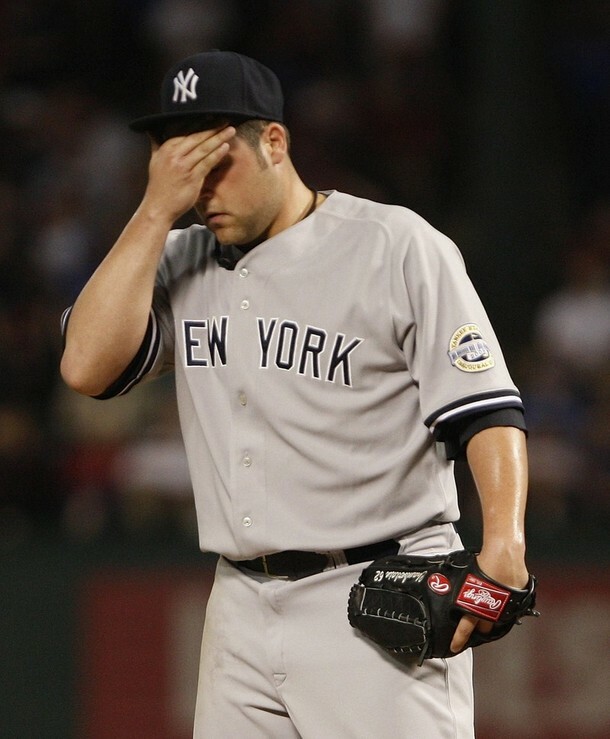 Remember when people wanted the Yankees to send Brett Gardner down because Melky was hitting better? Now, it’s a good thing he’s around. 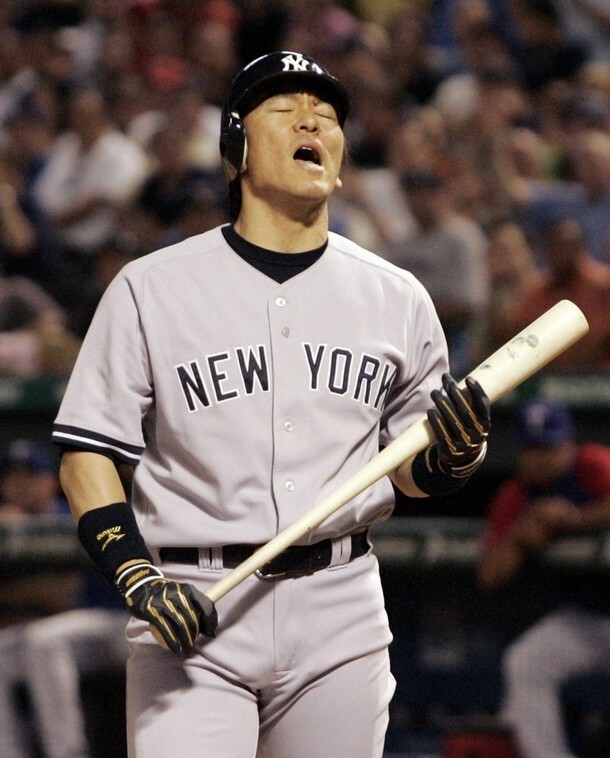 Matsui says, “I can’t believe we left 12 men on base and went 2-for-12 with RISP!” To be fair, Matsui wasn’t the biggest culprit here. That honor was shared by the foursome of Mark Teixeira (4 LOB), Nick Swisher (4), Francisco Cervelli (4) and Robbie Cano (3). Grounding into three double plays also didn’t help. I know that the last couple of weeks have been great and that one or two losses are not a big deal. But this game uncovered some issues that will only get worse as the season rolls on. Or maybe the rain delay just put them all to sleep. What the hell do I know? 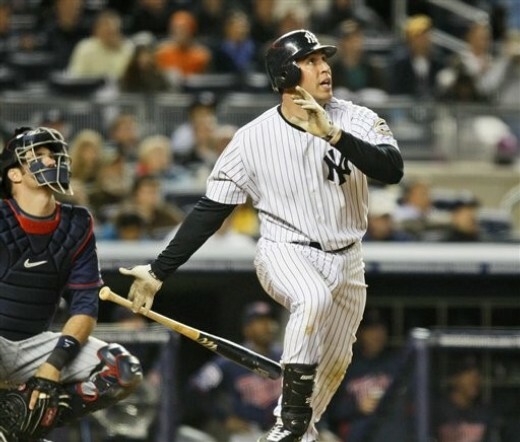 Mark Teixeira is quickly becoming The Man. Then again, everyone on this team seems to be vying for the title. How about Cervelli getting on base any way he can and not being afraid to show off his arm from behind the plate? How about Melky being aggressive in his at-bats? 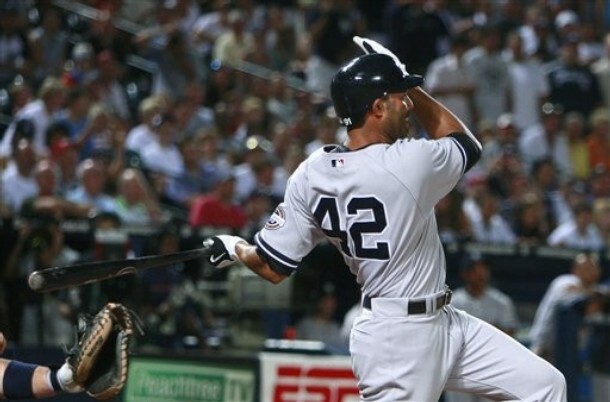 How about Jeter stabbing two hard-hit line drives that were headed straight for his face? And, of course, CC was kickin’ it. He’s another guy who must have that selective amnesia thing down pat. Even after a mistake, he just goes back and tries something else. I guess you can do that when you’ve got a bunch of options in your arsenal. This isn’t Yankees news, but last night Dontrelle Willis (Detroit) pitched well and got his first win since coming back from an anxiety disorder. I’ve always liked Dontrelle, and I’m keeping my fingers crossed for him to continue doing well. Anyone who knows how debilitating anxiety issues can be should be thrilled to see him get back on track. The crack of the bat, when you know for sure that it’s gone, is one of the coolest sounds ever. 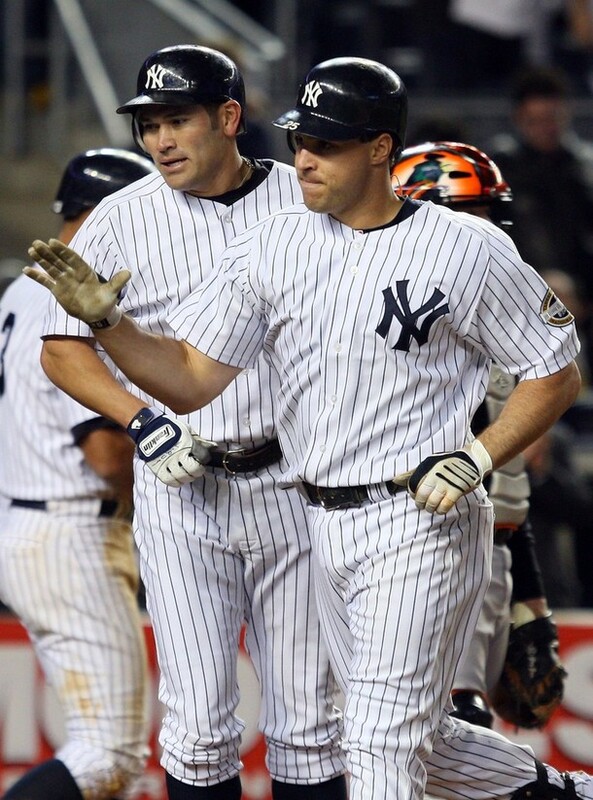 Tonight, Mark Teixeira went yard twice, one from either side of the plate. A-Rod also hit a bomb. It was nice to see the two of them jumping on some pitches. 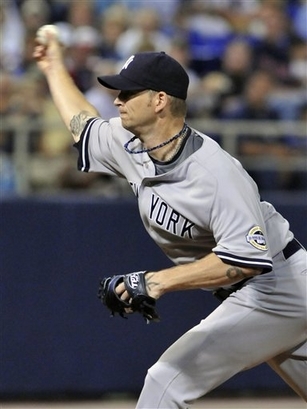 The defense was great behind Pettitte tonight. I am lovin’ Ramiro Pena and Francisco Cervelli. And Texy gets the gold star because in addition to his two jacks, he also made a couple of great plays at first. And, although, he gave me a minor heart attack at the end, I love that Phil Coke got the save. I’ve actually been pulling for him – out of all the bullpen guys in there – because I think he can be really good behind Bruney and Mo. He’s definitely a work in progress. It was nice to see him strike out Justin Morneau in convincing fashion in the eighth. Last year, nobody could get it going at the same time as anybody else. This year, it’s so much fun watching different players contribute in bunches. I’m looking forward to seeing them play in person in July. PS: If you have some time on your hands, check out the clip of CC, Swish, and Bruney fishing from Yankees on Deck on YES. Bruney is the Trout Master, apparently. Swish, like my husband and Joey on Friends, just wants to sit around eating sandwiches.